The first iteration of the Panama Canal revolutionized global shipping flows by allowing cargo vessels to transit from the Pacific to the Atlantic, and vice-versa, without traversing Cape Horn. Miraflores Locks under construction in 1912. We often lose sight of just how many goods a single ship can carry. A 10,000 TEU sized shipment would require 18 trains, 5,800 trucks or 570 aircraft. And while the pre-expansion Panama Canal already moves more than 290 million tons of goods per year, the awe inspiring post-expansion target is between 330-340 million tons. 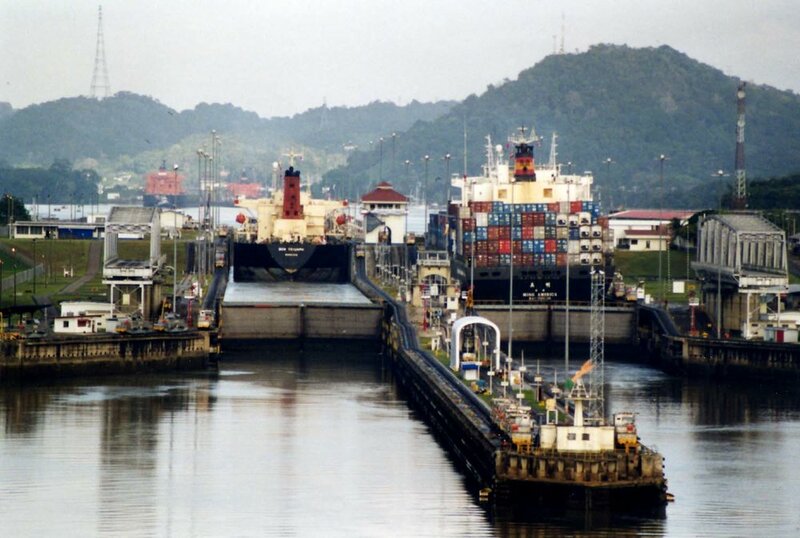 Miraflores locks at the Panama Canal, photo courtesy of Stan Shebs. Since larger vessels are more efficient, the ability to carry more TEUs through the Panama Canal will lower shipping costs. According to estimates, the reduction could be as high as $14 per metric ton .- or potentially hundreds of thousands of dollars per voyage. A side effect of the expansion could be a loss of intermodal cargo entering West Coast ports and continuing east by rail. It will be relatively more efficient for ocean carriers to bypass, e.g., the Ports of Los Angeles and Long Beach and instead steam to East Coast ports directly. However, conversely, certain U.S. exports concentrated in the East Coast will become more competitive, especially compressed liquid natural gas and coal. These imports can now enjoy a more direct route to Asian markets compared with the Middle Eastern competition. The current expansion is 72% complete. Due to cost overruns and construction delays on the part of general contractor Grupo Unidos por el Canal (GUPC), which is comprised of Spanish, Italian, Belgian and Panamanian subcontractors, completion is expected in December 2015. With the ever-increasing size of vessels, however, interest has already been registered by China Harbor Engineering Company (CHEC) in constructing a fourth set of locks. These would be able to accommodate up to 18,000 TEU. “We are exploring our participation in all Canal projects, especially in the design, construction and financing of a fourth set of locks,” said Mo Wenhe, who led a trade delegation from CHEC in early August 2014. According to the Miami Herald, CHEC plans to set up a regional headquarters in Panama. Aug 17 Wettbewerbsfähig? Spezialschiffbau ist seit Jahren "Made in Germany"